A new franchisor has many challenges when they commence their franchisee recruitment campaign. The biggest of which I often see is the temptation to take on a 50/50 franchisee. You know the type of individual we are referring to. It’s those potential franchisees who are “almost” right, but maybe have the wrong personality or skill set. You probably wouldn’t employ them in a salaried role, but you might sell them a franchise. To illustrate my point let me give you an easy example of a franchisor who sells widgets and the franchisees will be in effect a sales agency franchise network. Whether or not you take on Mr 50/50 comes down to your overall franchisee recruitment game plan. Are you running a Hare or Tortoise strategy? Let me explain with some tips for franchisee recruitment. Let’s say the Hare Franchisor takes on 10 new franchisees pronto. Whereas the Tortoise would have turned half of them down. The franchise is a £20k investment and the franchisor can pump £10k of that into marketing as there isn’t a lot of expense within the investment. Crucially those 10 franchisees allow £100,000 to go into marketing for the Hare’s franchise network. That £100,000 creates more sales leads than the cautious Tortoise who generally won’t reinvest anything like that amount. 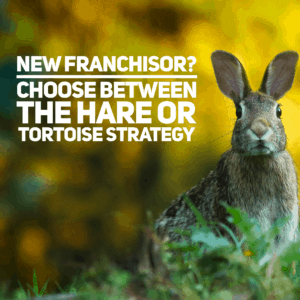 A Tortoise might do a pre-launch and a week or two initial training but then keep the margin to cover other expenses or create a profit on the franchisee recruitment. The Hare is recruiting lots of people and throwing money at their business to drag them into profit. This turns them from average 50/50 prospects into quite busy successful franchise owners. The Hare’s royalty is higher per franchisee as a result. Something else happens for the Hares of this world. They get momentum. Hare Franchisors will recruit the odd disaster following this strategy but to many franchisors, that’s a price worth paying. The economies of scale within a Hare’s franchisee recruitment campaign are compelling. The Hare has harnessed that cash flow and made it work for the network. This can turn a Steady Eddie into a Rocket Ron. The Tortoise is plodding along with a quieter life and slow and steady growth. There’s a lot to be said for this approach too. Tortoise Franchisors have a quieter life with better quality people, generally speaking. The Hare is dealing with all sorts of human issues of course because not every franchisee is a perfect fit. A touch of chaos might ensue. However, the whole company is more valuable, the royalties are higher, and the recruitment of higher calibre franchisees is made easier as everyone in the network is busy. For the Tortoise there aren’t the same growing pains either because the management has the time to spend with every new franchisee. Hare’s often scale up their support after the need for that support has arisen where as the Tortoise can probably soak it up within their current capacity. Given that most of today’s businesses rely on a prominent internet position the Hare’s strategy allows significant spend on SEO. If the franchisees are a part of the main website then the collective group benefit immensely from this. For this reason, alone everyone should at least think about being a Hare even if you later turn into a Tortoise! Here’s a couple of my own recent case studies. When I launched the Ambience Venue Styling Franchise with my wife Debbie we chose the Hare strategy to allow us to use the incoming monies to really nail our marketing. We were able to hire Loyalty Matters in Harrogate to design us a fabulous website which benefited every franchisee. Ambience had dozens of No.1 rankings for wedding chair cover hire, leads were flying in all over the country. Our prominence on Google allowed us to recruit more franchisees because when they did there research online they could see we were the market leader. Fast forward to today and I’m a tortoise! But only a tortoise as far as Lime’s own franchisee recruitment is concerned. Our Franchisor clients are making their own decisions as to their pace of recruitment and we mirror that brand by brand. Lime has opened a couple of regional offices under a franchise agreement and our plans for one or two more will come about but only as we get exceptional candidates, so maybe this year, maybe next. To a degree then the pace of franchisee recruitment is very much a personal choice for all franchisors. If maximising your franchisee recruitment monies is the name of the game then, in this race at least, it is the Hare that wins every time. Which strategy you go for does, however, make a huge assumption….. Do you have the right people who are able to recruit in the first place? If not then it’s probably worth having a chat with us about how we can help you to recruit whatever size franchise network you are aiming for, and offer more tips for franchisee recruitment. Fill in this form and we’ll contact you.